Their vision… “is to use the powerful message of the gospel to impact their generation; as well as promoting gospel music in mainstream communities”. Since the groups’ formation in 2003, its members have featured at various events across the UK and are beginning to break into Europe . They have also been opportune to have featured on various TV and radio stations; including BBC1, BBC3, Premier Christian Radio, BEN TV, OBE TV, LoveWorld TV, Revelation TV, Channel M, BBC Radio and more. Not only that but one of their band member Kristyna Myles broke into the UK album chart Top 10 song with her melodic song “My Lord”. This track appeared alongside tracks from Amy Winehouse and Erykah Badu on the compilation CD ‘Songbird 2008’. 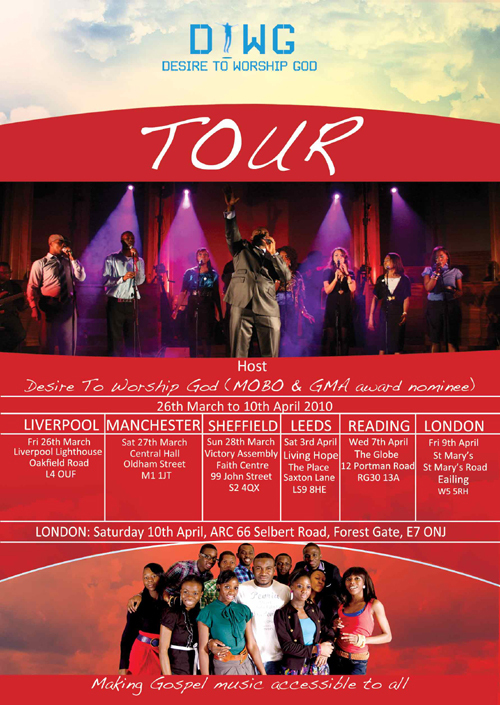 Having recently released their first album ‘The Project: Desire to Worship God’; DTWG has announced they will be taking their album on tour across the UK . The album has already been well received by Christians and non-Christians across the country. Since the release of ‘The Project’ DTWG has received much recognition and was recently nominated for a MOBO Award and a GMA; “watch out for bigger and better to the glory of God, in 2010” says Samuel the founder of DTWG. More about their tour: The tour kicks off on 26th March 2010, in the Capital of Culture itself, Liverpool and is hosted by Liverpool Lighthouse. On the 27th March the team will move to neighbouring City, Manchester , at Central Hall, Oldham Road . On to Sheffield on the 2nd April, Leeds on the 3rd April. The tour will then wind its way down south, where they will land at ‘The Globe’ in Reading on 7th April. The tour’s finale will be in London , the home of the team, with events supported by the YMCA, TFHI, KT and Restoration Team 9th, 10th and 11th April 2010. Osmond Collins: (International Psalmist, from USA ). He is an internationally recognised Psalmist / Worshipper / Singer Songwriter. His musical accomplishments include 4 CD albums Exalted One, Walk The Walk, Do It Again and He Will Restore. New Direction Crew (MOBO & UMA Award Nominees) are ground-breaking group of talented, young artists steadily making their mark, both on the Gospel scene plus wider circuits. Roger Samuels, considered as one of Britain ’s finest gospel vocalists. …and many more, this is one tour not to miss, it’s set to be great! DTWG album is available on www..dtwg.co.uk and is now available to download on all major download sites; including HMV, Amazon, and iTunes. This entry was posted by BEFFTA Editor on January 20, 2010 at 12:50 pm, and is filled under NEWS FLASH. Follow any responses to this post through RSS 2.0. Both comments and pings are currently closed.